Which came first, the Muppett, or Diane’s Bare-Hearted Glass Frog? The eerie similarities between Jim Henson’s Kermit the Frog and a new species discovered in Costa Rica could be just coincidence, but we like to imagine a more familial link. Seriously, though, the similarity in the eyes is uncanny. Brian Kubicki, founder of the Costa Rican Amphibian Research Center (CRARC), discovered the new species in the jungle, and named the frog after his mother, rather than the most popular green puppet of all time. What’s really cool is the fact that the skin on his stomach is transparent, giving us all the opportunity to take a good look at his internal organs–feel free to verify that it’s not just someone’s hand up there. 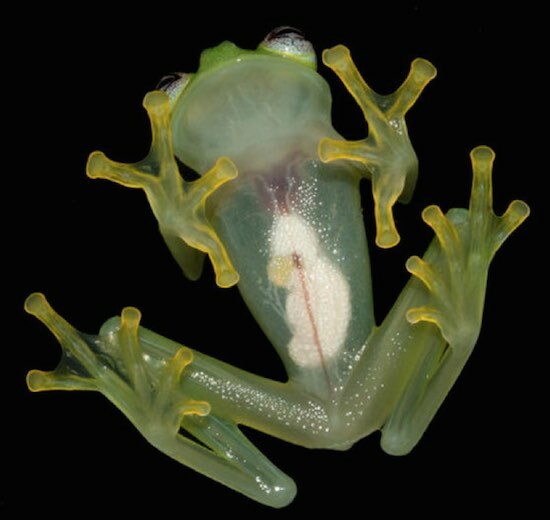 Hyalinobatrachium dianae has been documented online, including a special mention of his horizontally-shaped pupil and its resemblance to a certain someone.